I’ve asked Howie to unlock the Flickr page and reinstate it. I don’t agree with Flickr’s policy, but nonetheless feel it’s a social media I can use (as opposed to Tumblr, which I asked to have deleted as I wouldn’t use it. With more avatars adopting ‘older’ looking avatars around the grid, I’ve asked Barbara if she’s keen to pursue the role of ambassador for the older avatar. Expect to see more older skins (and suitable hairstyles and even age appropriate clothing) blogged. If Barbara rejects the role we’ll be advertising for someone to fill the position, so if you use an older avatar, starting filling in your CV! In the 1920s, in Germany, the Weimar Republic was ‘jazzing it up’ in an era of ‘decadence’ that the Nazis would subsequently try to sweep away. In terms of defining the era, and the ‘decadence’ of the era, I’d recommend the film Cabaret, starring Liza Minelli, which is a film I love, not only for which it portrays changing times, but contains some fabulous songs. In the 1920s, I’d imagine Sally Bowles outfit (above) was certainly risqué. Outside Berlin, the naturist movement was growing in strength. Later, the whole ‘strength through health’ idea was hijacked by the Nazis, and there are elements of naturism from that era that are closely associated with Nazism, a dark stain on our movement’s history. Our model, lets call her Sally too, is posing in the Kiki’s House of Burlesque club in Second Life, wearing a very similar sort of outfit to Sally Bowles in the 1972 film. After performing for a few pfennigs and marks, or having encouraged the clientele to part with more for champagne, Sally heads home through an excellent, period sim in Second Life called The 1920s Berlin Project. It has existed for a long time in Second Life and is a Weimar Republic role-play sim. When I visited to check it out before posting I was challenged by one of the players about not being in period dress. Which is fine. Their sim, their rules. Fortunately they prepare for this and so I was able to pick up some free outfits of period style clothing at the main tp point. 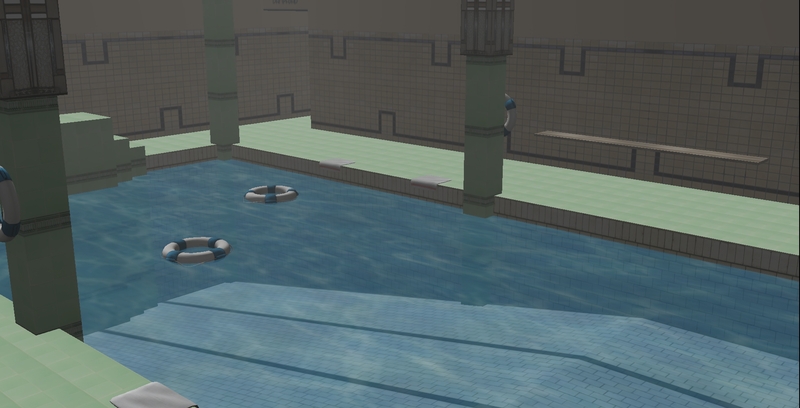 I needed to visit because I also wanted to set a landmark for the swimming baths, the Volksbad, itself. This is because it’s a tangle of narrow streets and alleyways and it took me a good twenty minutes to find the swimming baths! At the time, many houses wouldn’t have had their own bathroom (just a lavatory) necessitating a trip to the public baths for a weekly bath. The Volksbad has individual baths upstairs, as well as a more general communal pool (having visited Berlin I love the way they’ve accurately replicated green tiling, in the baths, in the railway stations. 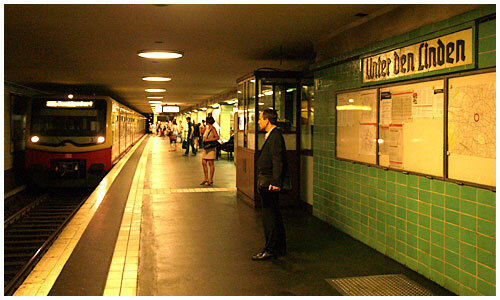 When I was there about ten years ago the Unter den Linden U-bahn (underground railway) station was still sporting its pre-war green tiling on the station walls, each of them oozing the rich history the city has seen in the past 100 years. The specific reason I’ve included this (apart from the potted history on naturism in Germany during the era) can be seen in the next photo. January 2nd (Saturday) at 12pm (by my reckoning that’s 8pm GMT, 9pm European Central time) there is a Nudist Hour at the baths! That’s right. 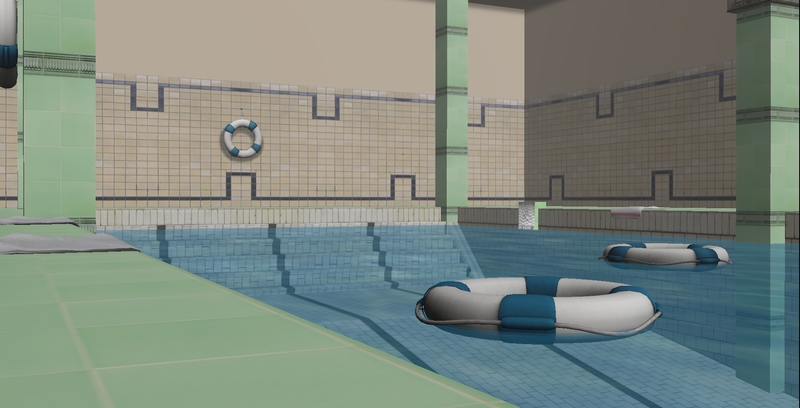 The sim acknowledges and embraces the naturist culture of the era, without being a naturist sim (and also having the swim in its proper location for the time, in the baths, although the Nazis would eventually only tolerate it in an ‘out of sight, out of minds’ basis away from the cities. For Berlin, that might have been somewhere like the Wannsee (still popular with naturists). I hope to be going along on Saturday night. (I intend to go along on Saturday night unless real life gets in the way, let me put it like that) so perhaps I’ll see you there? I know I said I’d be trying to stick with a specific hairstyle, but I’m going to see if I can locate a suitable period hairstyle. Remember, if you can’t find one, the hairstyle sported by ‘Sally’ is available, along with her dress and other period clothes (all free) at the main tp point.